On the tourist map of Tobago there are clearly marked, in a medieval type script, the names and sites of the various Forts which have survived here. In reality their survival is more in the name than in the remains that exist there. True Fort Milford has the odd wall, Fort James in Plymouth has bits of buildings but the only one that still exists in any size is Fort King George in Scraborough. This at least has buildings still in use plus numerous cannons (not in use!) and a museum. The rest are simply names with maybe a seat or two, and perhaps if you are very lucky a cannon to sit on as well. What they all have in common however is a view. Fort Milford with its seats facing the sea is an ideal place to watch the sunset over the Caribbean. 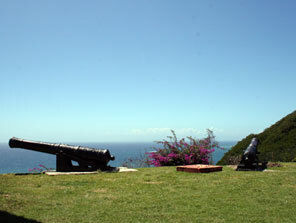 Perhaps the best is Fort Cambleton, just outside Charlotteville on the coast road. On the map it is shown well inland, I don’t know if there is anything where it is marked. But the lookout is signposted and is only a short and pleasant walk westward out of Charlotteville. Here there is a roofed picnic area with cannons all round. The view is spectacular! There are two more Forts not on the map, one is Dutch Fort now remembered by the name of the road in the centre of Scarborough, that leads up to its old site. This fort was destroyed by a lucky (for whom?) French cannon ball. It hit the forts arsenal and blew up everything including the entire garrison, excluding one lone survivor. The English and French who built Fort King George (not together I must add, but each built during their period of occupation!) learnt a lesson from this and built positively the most secure arsenal I have ever seen, sited just below the fort. It is still there, a bit dirty inside and full of bats, but worth a look! Take the highway in the Roxborough direction, passing the Botanic Gardens and turn left at the Calder Hall traffic lights. A short way down this road you will see a football pitch on the right, at a crossroad. Turn right here and follow this road down hill across a bridge and then uphill again. On both sides of the road are dense woodlands. The road is well paved for a while and then becomes well and truly pitted with potholes. Cars can manage this road without problems, but slowly! The road improves slightly, all the time passing lush tropical woods with the very occasional house, and at the same time winding its way uphill. At the very there is a main telecommunication centre of Tobago and, more importantly from your point of view, spectacular views across the Island. The sunset from here must be wonderful! There are a number of roads just before the summit of the hill which would probably be fun to explore in a four-wheel drive vehicle.